Given the information available to the police officer at the time of your arrest, would that information cause a reasonable and cautious person to believe that a crime committed. Probable cause to arrest is different from reasonable suspicion to detain you to investigate. 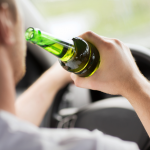 While the driving and the initial observations of symptoms of drinking will usually suffice to establish reasonable suspicion, more needed to rise to the level of probable cause to arrest. Your driving is relevant to the determination of probable cause to arrest, and it is evidence that can cut both ways. For example, if you are weaving all over the place, it is a factor that would cause a reasonable person to think that alcohol or drug impairment could be a cause. On the other hand, if there was no bad driving, perhaps your stopped at a DUI checkpoint, or for a broken windshield, your DUI attorney may have a good argument that your good driving, or the lack of observable bad driving, would lead a reasonable person to believe your not impaired. As long as the defense is able to establish that you were arrested and that the police didn't have an arrest warrant at the time, the trial Judge is then obligated to weigh all of the evidence to make a determination. The facts that they use to make the decision must be specific. Recently, a DUI attorney won a dismissal in a DUI case when the prosecutor asked the officer what he based his arrest on. It was based on the field sobriety tests, the driving, the odor of alcohol, and the admission by the client that he had been drinking. The client was probably shocked when the DUI attorney said, no questions. Their look spoke volumes. The Judge asked the prosecutor if they had any evidence to present. They rested. The Judge asked if the DUI attorney had witnesses. The DUI attorney shook their head no. The Judge smiled back, letting the DUI attorney know that they realized the prosecutor's mistake. The Judge then asked the prosecutor if they had any argument. The prosecutor argued probable cause. The DUI attorney said something like "I agree with everything the prosecutor just said, except I disagree with their conclusion." Then the DUI attorney sat down. The Judge ruled the state had not shown probable cause. None of the officer's observations were enough to cause to believe a crime committed. The field sobriety tests may have been enough, but since the prosecutor failed to present any testimony about the specifics of the tests, and instead relied on the officer's blanket conclusion, there were no facts in evidence for the Judge to consider. The DUI attorney leaned over to their client and told them to leave the courtroom immediately, to not look back, and that they would call them to explain. As the DUI attorney slowly packed up their briefcase, the prosecutor frantically moved the Judge to allow them to reopen their case and allow the officer to testify to fill in the gaps. Their mistake had been made and double jeopardy now prevented the Judge from litigating their client's case again. The following case was a DUI prosecution in a very small town with a fairly inexperienced prosecutor. The DUI attorney brought a motion to dismiss because the state lacked probable cause to arrest. It was a low probability motion, but under the circumstances worth bringing up to test the prosecutor. The arresting officer was not there. Now in case you haven't figured it out yet, the arresting officer made the arrest decision. They are the one who must testify about their reasons for that arrest decision. The DUI attorney thought continuation of the case. The officer possibly detained on an emergency call. Feeling pretty confident in their case, the prosecutor announced "ready." The Judge said to the prosecutor, "call your first witness." The prosecutor said "I don't have any witnesses, I'll get what I need out of the defense witnesses." "Ok," said the Judge. "Then does the state rest?" It was time for the first witness called by the defense. This was the first time for the DUI attorney in that court. The Judge was probably wondering if they had the two least experienced lawyers in the state in their courtroom at once. After all, at the time the DUI attorney was in their late 20's, but looked like they were 15 years old. "The defense will not be calling any witnesses today, your honor," the DUI attorney said. "Very well. No need to hear argument on this, the Defense's motion granted. Case dismissed." the Judge said. The DUI attorney leaned over and told their client to get out of there and don't look back. Never underestimate a young prosecutor's ability to overestimate their abilities. Never shy away from a low probability motion, you never know when the state is going to drop the ball. Explain how you will act under different circumstances during litigation. You won't have time to explain your methods on the fly. If you know the prosecutor screwed it up, don't ruin it by telling the Judge what the prosecutor did wrong. Judge's need specifics, not conclusions from witnesses. If not, they'll need to dismiss the case if they are acting consistent with their judicial oath.